As part of the Free subscription plan, Convertize installs a small graphic that appears in the bottom left corner of your website. It appears on pages that contain the Convertize pixel and on the optimisation platform itself. Users who are subscribed to the “Solo”, “Team” and “Agency” plans do not see this branding. You can see the different Convertize plans on our pricing page. When visitors click on the transparent grey “Optimised by Convertize” element they are taken to the Convertize website. In order to remove this logo, you will need to upgrade to another plan. By default, Persuasive Notifications contain a small “Verified by Convertize” label in the bottom corner. The label is not promotional; it is used to assure visitors that the notification is accurate. 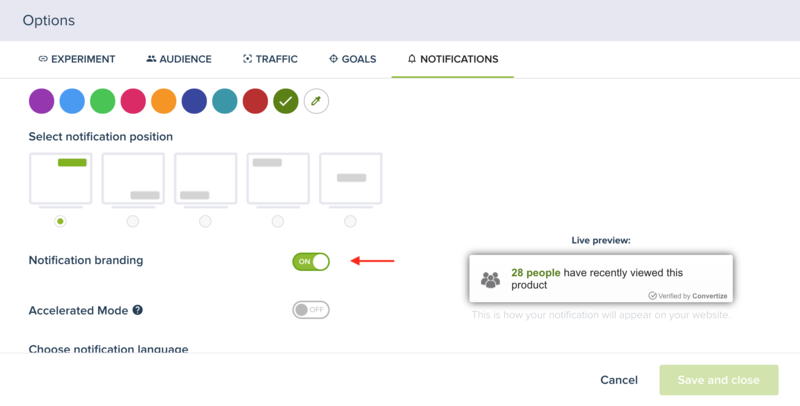 Persuasive Notifications include those messages based on Scarcity, Urgency and Social Proof. The label also appears on custom notifications that use standard variables. A list of these can be found within the Persuasive Notifications Workspace. Users on a paid plan can remove branding from their notifications by logging in to the Convertize platform. Once logged in, select ‘Options’ in the Smart Editor and navigate to the ‘Notifications’ tab. As shown in the image below, you will see a toggle that allows you to control the branding settings. For users who downgrade to the Free account from a paid plan, the branding will automatically be switched back on.